Progressive-die designer and builder Performance Tool & Die committed three years ago to 3D designs, to keep up with market demand for increased part complexity, according to engineering manager Ron Barnes. And the move has paid off. Performance Tool & Die designed this complete nitrogen package for a recent 17-station progressive die built for an automotive customer. The setup, built using the Dadco SMS-i system, features eight nitrogen-gas springs mounted to a common base plate that occupies two of the 17 stations. A series of passages drilled into the plate connect the springs. Performance Tool & Die operates out of a 26,000-sq.-ft. shop in Lakeville, MN, staffed with six designers and 10 toolmakers. Its equipment list includes six CNC machining centers and three wire-EDM machines, as well as six tryout presses from 150 to 600 tons. When I spoke with Barnes, the shop had work in various stages of completion—from design to tryout—for 37 different parts. The SMS-i system mounts underneath the die and, thanks to the easily accessible pressure gauges and regulators, enables the end user to monitor and adjust pressure as needed across the system. For the spring-seat application, Barnes and his team designed and developed, along with the help of an engineering team from nitrogen-spring manufacturer Dadco, Plymouth, MI, a base plate encompassing two die stations with a set of nitrogen-gas cylinders mounted to it. 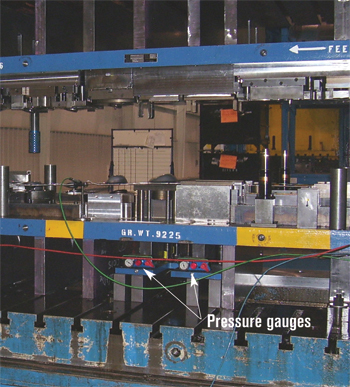 The package—designed using the Dadco SMS-i (Sectional Mounting System– Internal) system—calls for connecting a set of springs by drilling passages throughout the base plate. It avoids the need for external hoses and fittings, and results in an inexpensive setup that is relatively simple to install and maintain, says Barnes. The SMS-i setup designed by Barnes and his team encompasses eight nitrogen-gas springs, all Dadco UltraForce high-force low-profile models. 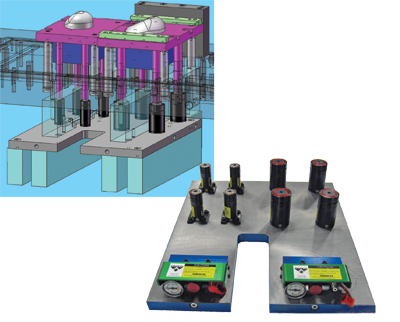 In the first of the two die stations covered by the SMS-i plate resides four heavier die springs—U.1200 models with 50-mm-dia. body and 1.2-ton pressure capacity. In the second die station sit four U.0400 UltraForce springs—32-mm-dia. body, 0.33-ton force capacity. In addition to drilling out the base plate to connect the springs together, Dadco also installed two mini control panels and pressure regulators to allow the end user to monitor and vary gas pressure across the system. The gas springs attach through a bottom port, and the SMS-i allows for convenient filling and draining as needed.